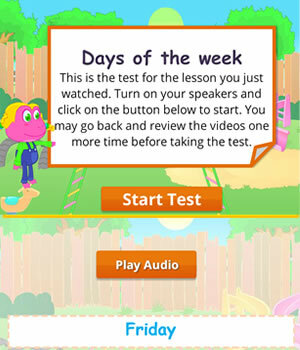 This English lesson will teach ESL/EFL young learners how to talk about days of the week and activities we do during the week. 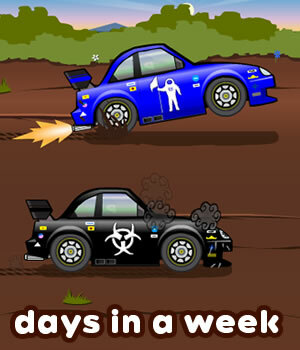 They will learn the days of the week vocabulary and describe weekly activities using adverbs of frequency. 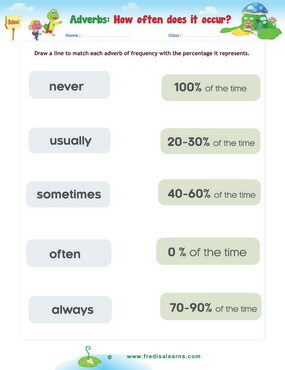 This lesson extends knowledge of adverbs of frequency by adding 'sometimes' and 'never' to 'usually' which was taught in earlier lessons. The worksheets below are useful for offline and classroom activities. 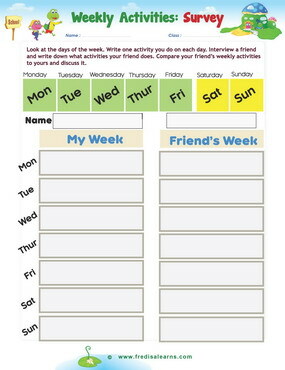 These printable exercises directly correlate with the above lesson 'Days of the Week'. Every worksheet comes with an answer sheet on the second page for educators. Freddie, Lisa, Bob, and Sally are on their way home from school on a Friday. They are looking forward to the weekend with no lessons. A conversation about weekly activities begins. School is five days a week. What do you usually do on weekends, Sally? I usually stay at home and watch TV. We sometimes play volleyball at the park.